On March 30, Ambassador Martin Fleischer, vice president and director of the Regional Security Program, moderated the discussion “Kyrgyz Republic: Democratic Reforms and Foreign Policy Priorities” with H.E. 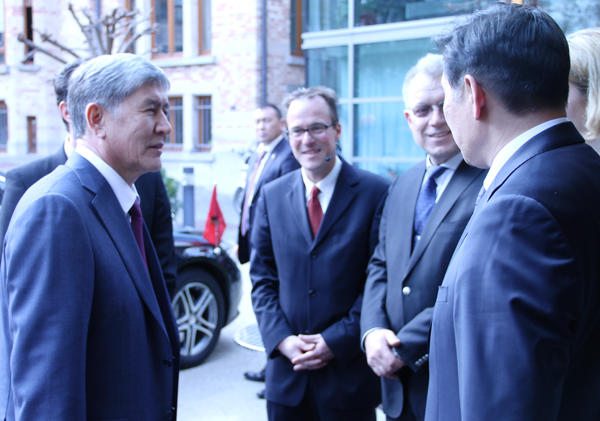 Mr. Almazbek Atambayev, president of the Kyrgyz Republic, jointly with Christian Forstner, director of the Hanns Seidel Foundation in Brussels. The event gathered high-level participants from EU and NATO institutions, the diplomatic community, and NGOs in the premises of Bavaria’s representation to the EU. During his speech, President Atambayev reviewed the progresses made in the fight against corruption and the containment of Islamic radicalization. Moreover, he stressed his commitment to strengthening people’s faith in Kyrgyzstan’s democratic process and to carrying out free and fair parliamentary elections in Autumn 2015. Asked by Amb. Fleischer about Kyrgyzstan’s geopolitical position, President Atambayev highlighted the importance of establishing amicable ties with all neighboring countries. Kyrgyzstan considers itself a bridge between Europe and Asia, and in this respect sees the EU as an important partner that could be even more engaged in the region. At the same time, the country is developing its economic ties with neighbors. The foreseen accession to the Eurasian Economic Union by May 2015 should not be seen as a contradiction to the partnerships with the EU and NATO. President Atambayev was also optimistic about deepening cooperation with China and in the framework of the Shanghai Cooperation Organization. Following the discussion, the President opened a photo exhibition depicting the dramatic revolutionary events of the year 2010, as well as the rich culture and tradition of the country.